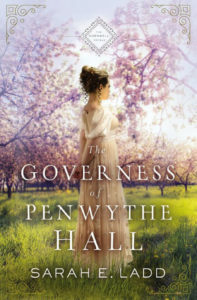 "The Governess of Penwythe Hall"
Cornwall, England, 1811 Blamed for her husband’s death, Cordelia Greythorne fled Cornwall and accepted a governess position to begin a new life. Years later her employer’s unexpected death and his last request to watch over his five children force her to reevaluate. She can’t abandon the children now that they’ve lost both parents, but their new guardian lives at the timeworn Penwythe Hall . . . back on the Cornish coast she tries desperately to forget. Jac Trethewey is determined to revive Penwythe Hall’s once-flourishing apple orchards, and he’ll stop at nothing to see his struggling estate profitable again. He hasn’t heard from his brother in years, so when his nieces, nephews, and their governess arrive unannounced at Penwythe Hall, he battles both grief of this brother’s death and bewilderment over this sudden responsibility. Jac’s priorities shift as the children take up residence in the ancient halls, but their secretive governess—and the mystery shrouding her past—proves to be a disruption to his carefully laid plans. Rich with family secrets, lingering danger, and the captivating allure of new love, this first book in the Cornwall Novels series introduces us to the Twethewey family and their search for peace, justice, and love on the Cornish coast. "The Governess of Penwythe Hall" is such a great start to this brand-new series by Sarah Ladd. Right from the very beginning I was drawn into the story, partly because my heart went out to Cordelia, but also because of the descriptive writing. It truly is easy to become lost in the story and feel the scenes come to life as they are described so vividly. Cordelia has had to deal with so much, death of her husband, the hatred spewing from her mother-in-law, and the hurt and love she feels for her charges and having to return to Cornwall where she hoped to never return. Jac is another strong, determined character who is also dealing with much in his life and I admired him as well. This is a beautifully written story and historical romance fans will not want to miss out on it! 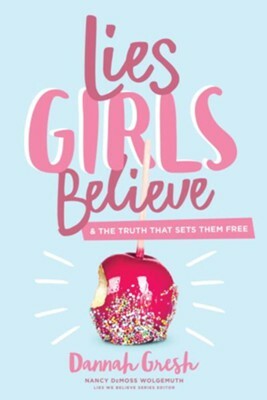 *Thanks to the Celebrate Lit Team for including me on this blog tour and for the complimentary copy of this book." 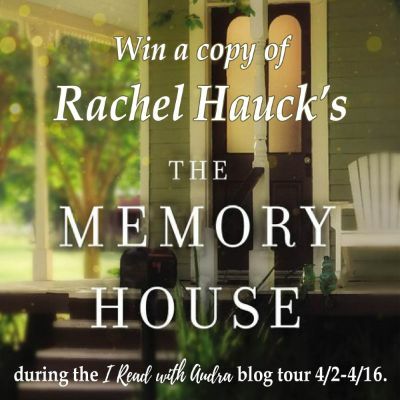 WIN a copy of "The Memory House"
Oh my goodness, this was an amazing book! I wanted to keep on reading it to find out what was going to be decided, what was going to happen next, but then once I finished it, I was not ready for it to be done. I loved how this was written in current day with Beck's story and then years ago when Everleigh's story to know what led her to this house and the room created on the upstairs floor. All of the characters just come so alive on the pages and they are all facing major decisions and changes in their lives, either relationship wise, with their jobs, with their immediate families, past trauma and guilt, some are dealing with all of the above. It really felt like I knew these characters as I cried with them, laughed with them and smiled when things were looking up for them. The message of forgiveness and healing is so powerfully portrayed through characters as they work through past hurts and seek to do what is right. 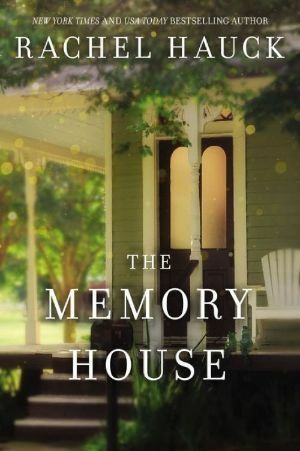 "The Memory House" is a story that will stick with me for a long time and one that I am highly recommending. "The Edge of Mercy" blog tour! "The Edge of Mercy" is a book that will appeal to so many as it is a current day story as well as a historical one all woven together. Sarah is struggling to hold her family together as a whole unit in the midst of doubts and suspected betrayal. While dealing with this, she is asked to help a friend who is desperate for a task to be taken care of for her before she passes. Sarah dives into Elizabeth's story and life, a woman who lived a few centuries ago and who was dealing with struggles of her own. The historical details just bring Elizabeth's story to live and it was felt as if I were transported back in time with the rift between the settlers and natives. Sarah was so easy to feel a connection with as well and her character came to live in the pages. This is an inspiring story of hope after heartache and suffering and God's help through it all. 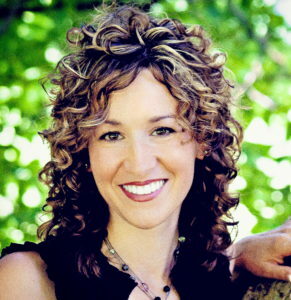 Heidi Chiavaroli began writing twelve years ago, just after Jesus had grabbed hold of her heart. She used her two small boys’ nap times to pursue what she thought at the time was a foolish dream. Despite a long road to publication, shehasn’t stopped writing since! Heidi won the 2018 ACFW Carol Award for Debut Novel and is a 2018 Christy Finalist. Both her debut novel, Freedom’s Ring, and her sophomore novel, The Hidden Side, are 4½-star Romantic Times Top Picks. Freedom's Ring was also a Booklist Top Ten Romance Debut. Heidi loves exploring places that whisper of historical secrets, especially with her family. She loves running, hiking, baking, and dates with her high-school sweetheart and husband of fifteen years. Heidi makes her home in Massachusetts with her husband and two sons. Six beloved authors deliver romantic Valentine novellas set in Jane Austen’s Regency world. Robin Helm, Laura Hile, Wendi Sotis, and Barbara Cornthwaite, together with Susan Kaye and Mandy Cook, share variations of Pride and Prejudice, Persuasion, and Sense and Sensibility, featuring your favorite characters in sequels, adaptations, and spinoffs of Austen’s adored novels. Experience uplifting romance, laugh-out-loud humor, and poignant regret as these authors deftly tug on your heartstrings this Valentine’s Day. This is such a fun and romantic anthology to read! I thoroughly enjoyed every single story in this collection. 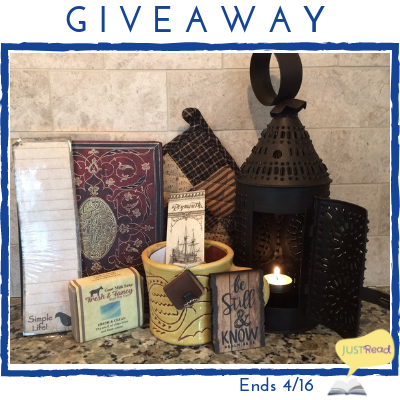 All are based on some of Jane Austen's characters and they are retellings that are sure to delight any Austen fan or really anyone whom enjoys reading stories set in the Regency era! I love that each of the stories is written by a different author, so I was introduced to new authors and also each story has a different feel, or style of writing to it. If I had to choose a favorite from this collection, it would be "My Valentine" by Mandy H. Cook. I really liked Charlotte and how her character was portrayed. She had to deal with challenges and she managed them and now is trying to find the balance between who she is as a person and not losing who she is but also opening her heart to love. This is a great collection that will have you smiling, and enjoying the sweet, clean romance that is shared among the characters. Robin Helm’s books reflect her love of music, as well as her fascination with the paranormal and science fiction. Previously published works include The Guardian Trilogy: Guardian, SoulFire, and Legacy (a guardian angel protects a supernaturally gifted girl), the Yours by Design series: Accidentally Yours, Sincerely Yours, and Forever Yours (Fitzwilliam Darcy switches places in time with his descendant, Will Darcy), and Understanding Elizabeth (Regency sweet romance). 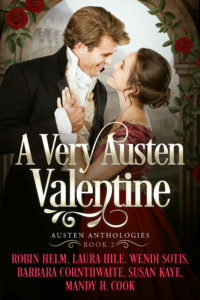 She contributed to A Very Austen Christmas: Austen Anthologies, Book 1, an anthology featuring like-minded authors, in 2017, and A Very Austen Valentine: Austen Anthologies, Book 2 which was released on December 29, 2018. 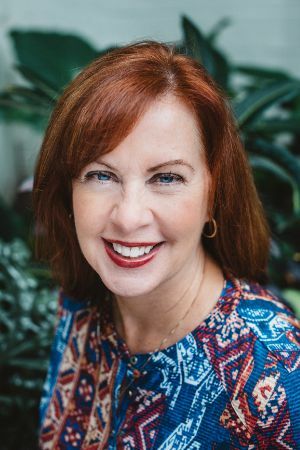 New releases for 2019 include More to Love, a standalone historical sweet romance dealing with body image; Lawfully Innocent, a historical U.S. Marshal romance book in the Lawkeepers series; Maestro, a historical sweet romance featuring a brilliant musician and his student; and A Very Austen Romance: Austen Anthologies, Book 3. 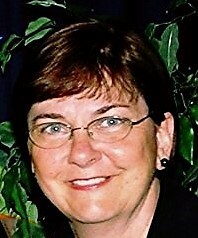 She lives in sunny South Carolina where she teaches piano and adores her one husband, two married daughters, and three grandchildren. Do you love Historical romance, but avoid “those” covers like the plague? Would you enjoy an anthology featuring six Valentine-themed novellas set in the Regency period written by Christian authors? In A Very Austen Valentine, stories range from a young wife searching for a way to bring her marriage back to the way it was, to a laugh-out-loud courtship between Jane Austen’s worst snobs. Misunderstandings, concealed identities, and romance abound. There is even a sequel featuring the children of the Darcys and the Brandons. Every reader will find something to love in this wonderful collection. Grand Prize: a $50 Amazon gift card 1st Place: An autographed paperback of A Very Austen Valentine: Austen Anthologies, Book 1 2nd Place: An autographed paperback of A Very Austen Christmas: Austen Anthologies, Book 2 3rd Place: A set of three ebooks – Reader’s Choice of any three of my books and 4th Place: a $5 Amazon gift card!! What happens when doctor and patient find themselves in the same sinking boat, yet rowing in opposite directions—one clinging to the past, and the other unable to move beyond it? Sam returns home from a business trip a day before his son's thirteenth birthday to find his world cruelly shattered in one fell swoop. Initially thinking he can cope on his own, Sam finally seeks the help of Cynthia, an experienced therapist. What he doesn’t know is that Cynthia herself is trying to recover from a debilitating divorce and the sinister shadow of her ex-husband. In the midst of it all is Lily, Cynthia's daughter, who harbors a secret that has the power to explode the lives around her. Taut with tension and intensity, "Dark Blossom" explores what lies beneath the surface of the lives of apparently “normal” people. "Dark Blossom" is a wonderful debut novel from Neel Mullick and he is going to be an author to watch. Cynthia is back to working with patients after taking time to process and work through a change in her own life, and yet she is unprepared for how Sam and his story is going to affect her personally. Sam has not been able to cope with the death of his wife and child and is reaching out for help. As Cynthia and Sam's lives become intertwined they are forever changed. I loved how this story flows so nicely and at the same time kept me furiously turning pages to find out what was going to happen next. Having a counseling degree and background, this book was so interesting to me and I love learning how people are impacted by situations and how they are coped with. Each person we come into contact will have an impact on our lives, big or small, large importance, or little impact, no matter it is some type of impact. The characters are all well-developed and become so real, it truly felt as if they came to life within the pages. I am eager to see what Neel will write next! Neel Mullick is the author of "Dark Blossom." The Head of Product and Information Security at a Belgian family-office technology company, Mullick is a graduate of Carnegie Mellon University and INSEAD. He mentors female entrepreneurs through the Cherie Blaire Foundation for Women, is involved in raising a generation of digital and socially aware leaders with Nigeria’s Steering for Greatness Foundation, supports improvement in the quality of life of domestic workers through Peru’s Emprendedoras del Hogar, and works with IIMPACT in India to help break the cycle of illiteracy plaguing young girls from socially and economically impoverished communities. "Dark Blossom" is his first novel. "Open-Door Living: easy ways to share the gift of hospitality" is such a nice book! This is a square, textured hardcover edition and it is filled with photographs, recipes and tips. Jen addresses the concept of hospitality, really the heart of it, and explores the differences between entertaining and hospitality. Then she addresses in various sections, different aspects and areas that are connected with opening our homes. Creating a welcoming space is discussed with suggestions for doing it. Eating and food is a large part of social gatherings and being hospitable, so numerous recipes are shared. An interesting section to me is when Jen discusses our senses and how to make our homes appealing to all of the senses, taste, touch, feel, smell, sound. Cozying up the home is something that plays into our senses and I think we all long for that cozy, at home feeling to really come through and be apparent to ourselves and others. Jen has even included conversations starters, so this book is truly a complete guide to being hospitable. I highly recommend this book, you will not be disappointed.